The Novosbed memory foam mattress uses high quality materials and comes with unique Comfort+ program, where the company will send free additional layers to adjust the softness or firmness. Is Soft the right bed for you? Based on 22 real owner experiences with this brand. How do people like you rate their Soft mattress? Mattresses are personal. Filter the 22 Soft ratings by sleep position, weight, age, gender and more to find the ones that are most relevant for you. The Novosbed Soft mattress model is recommended by 86% of owners on GoodBed (based on 22 ratings + 11 reviews). Want more reviews from Soft mattress owners? Do you have a Novosbed Soft mattress? Write a Review! Here are some large retailer sites where we’ve found ratings of this specific model. Note that mattress rating scores on retailer sites tend to be higher (learn more), and GoodBed can't assess the trustworthiness of these reviews. Have a question about the Soft? 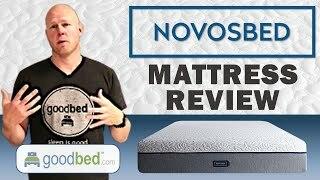 Max allowable body impression: 0.75"
Which mattress from Novosbed is best for you? Before shopping at Novosbed, take a short quiz to find which of their mattresses best matches your unique needs and preferences. Powered by GoodBed’s intelligent matching technology, you can even get your personal match score for each of Novosbed's available mattresses, in addition to other online options that match your criteria. The Soft is a pillow top foam core very soft mattress model released in 2016 that is manufactured by Novosbed. The Novosbed Soft mattress model was previously known as the Novosbed Harmony. Have an update or correction to our information about Novosbed Soft? If so, please take a moment to suggest an edit. Novosbed Soft mattresses are only available online.